Fish Crumb Fry recipe by Nazia Nazar at DesiRecipes.com. Any one boned, firm fleshed fish: 500 gm. Clean and slice the fish into thin big pieces. Beat the egg well and make a thick batter with the maida and enough water. Add salt and pepper to taste. Dip the fish slices in the maida egg batter. Roll in the bread crumbs and deep fry over low flame till the fish is browned. Cut potatoes into thin strips and deep fry. Add salt and shake well. Cut tomatoes into rounds. 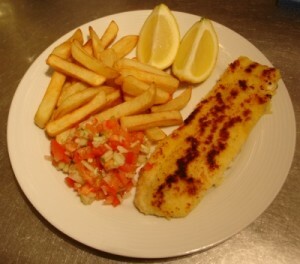 Serve the fish with the fried potatoes and sliced tomatoes, bread and butter and a soup.